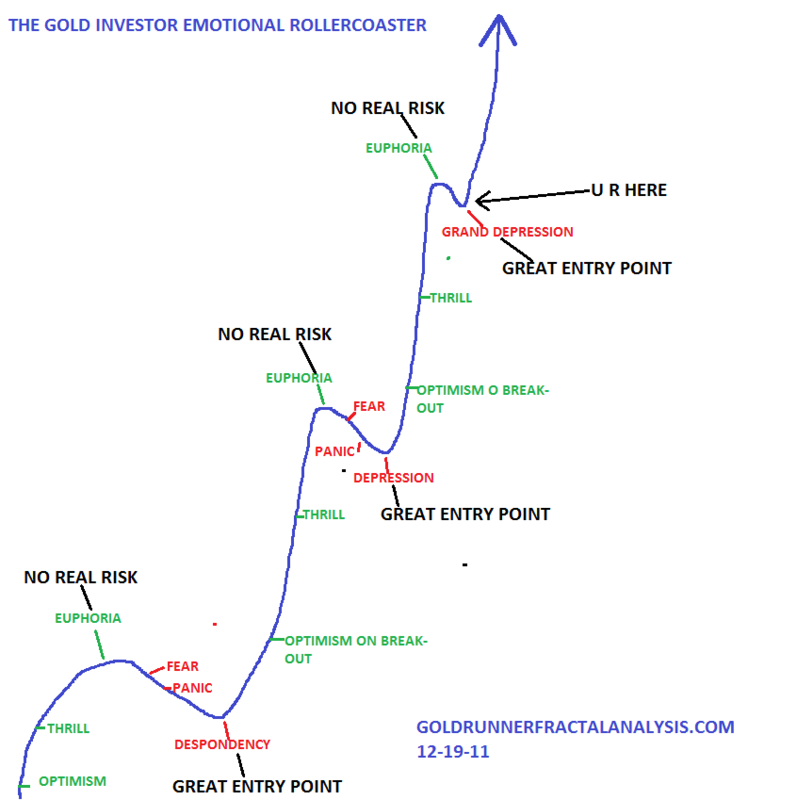 Where are Gold & Equities in the 3 Phases of Bull & Bear Markets? Bull and bear markets almost always repeat in a similar pattern and people’s behavior is all too predictable. A new bull market typically starts with a gradual rise in prices of an investment class that no one has wanted to own for a long time, and consequently the price is very low. Then it slowly starts going up, but peoples attitude still remain negative. After a lengthy bull market with steadily increasing prices, people start noticing the new asset and it gets more and more media coverage. The institutional players buy into this new market and prices continues to rise. Finally, after the price has gone up many times over the public wants in on the price action. The price keeps rising faster and faster and a sense of euphoria starts to set in among investors. Then shortly thereafter, the price starts to fall, and people realize some time later that they bought near the peak of the market and it is now well on the way down. Have you ever gotten caught buying at a top of a bull market, whether its stocks, real estate or commodities? If so, then congratulations, you have taken one of the first steps in the education process of becoming an informed investor. Now the second step is to see how bull and bear markets actually work, and this time you can be in control and get in front of the market, rather than to let it run all over you. Bull and bear markets typically have three distinct phases, and we will investigate theses phases in this article. By understanding the behavior of these phases you will be able to following along as the bull market progresses. You will get much more control over the timing of your investments, and be able to get out before the top. Phase 1 – Denial. The first phase in a bull market begins as its last bear market is ending. After a long-lasting bear market hardly anyone is even interested in the investment class, and almost no one is thinking of watching for a bottom. The asset class has been dismissed as a poor investment long ago and there is very little interest left. The stock market of the early 1980’s is a good example of this. The sentiment at the time was very different, and the market had gone nowhere for more than 16 years. The market zigged and zagged, and no one was even considering the “buy and hold” strategy as a viable option as the bear market finally ended. People had been burnt over and over again, and nearly all of the investment public had thrown in the towel. So, once the final bottom had been formed, market participants remained highly skeptical, and tended to stay away from the market even as prices continued to rise. Only the so called “smart money” participated in this in this early phase of the bull market. Phase 2 – Climbing a Wall of Worry. The second phase of a bull market is when the general investing publish becomes aware of this new market that is continuing to move higher. This is usually the longest lasting phase of a bull market and it’s characterized by higher volatility. During this phase, the media starts to cover this new sector and you start seeing experts being interviewed on television. Still, uncertainty remains the theme of the day and most of the investment public finds it hard to take action. They see the prices rise, but in the back of their mind they still remember the last painful bear market and many consider the asset class too risky. Despite increasing media coverage, people are skeptical and the naysayers are dominating the airwaves. Only after many years of out outperformance in the sector does the sentiment start to change and the market participants start to feel good about the investment they have made. After a long period of strong performance people starts to forget about the last bear market, and with a new optimistic attitude the moods becomes more positive and we enter the next phase of the bull market. Phase 3 – Euphoria. Year after year of good returns have silenced the bears, and most of those who remained bearish in phase 2 have now changed their mind. The bulls dominate the media and make up compelling arguments why prices will continue to rise indefinitely. It has become conventional wisdom that this investment class always goes up and you begin to hear familiar phrases such as “stocks for the long run”, and “real estate will always go up”. The public starts to invest en masse in this asset class, bidding up prices faster and faster, accelerating the returns and making it exhilarating for everyone. The last few investors that still sit on the side line usually gets pulled in during all this excitement. Then, at the top of this excitement a problem starts to occur. There are not enough new investors left to continue to bid up the price so the whole thing starts to slow down but after years of superior returns most people no longer remember the pain of the last bear market and they remain hopeful, even after the market starts to head down. This is often referred to as the “bear slides down the slope of hope”. After a decade long bull market most investors are still convinced that this investment is infallible and it usually takes several years for reality to finally settle in. After the market has peaked out, the new bear market phase begins, which goes through a cleansing process until there are no more sellers left. Only then, when all remaining investor have been cleaned out can this investment class repeat the cycle over again. You can see historical patterns of bull and bear markets by looking back in time and taking a look at the performance of stocks during the 50’s and 60’s, commodities and gold during the 70’s, stocks again in the 80’s and 90’s – and now commodities and gold since the year 2000. 7. Where are We Now in the Bull Market in Gold – and How Many Years/Months are Left? 8. What Do the Presidential and Decennial Cycles Infer Will Happen in 2012? Next Gold Bullion, Stocks or Bonds: Which Have More Long-term Investment Risk?